This piece of writing needs context, to help initiate the reader. What I originally set out to write about was the un-seeing of women. I had experienced many social interactions in which my life and true self were not of interest to those around me. These individuals were more concerned with themselves or my children. I suppose that they were seeing my children as all of me or an extension of me, rather than seeing the separate person I was and am. Did these experiences really matter? Was I being narcissistic or needy? Maybe they just didn’t like me……But then I realized it wasn’t just happening to me. I had interactions with women on social media and in my inner circle who claimed similar experiences – their inner lives, desires, personhood, self-care needs were not seen as significant or worthy of interest by those around them; their children or relationship to others took the forefront of their personal lives. There was a silencing, an ignoring of these women. Initially, I assumed that this un-seeing was somehow related to motherhood, as this particular life stage is recognized by some as disempowering for women, despite our culture’s obsession and insistence on motherhood as a worthy ideal (see Adrienne Rich, Of Women Born: Motherhood as Experience and Institution). However, women who are not mothers, including friends of mine, feel silenced and ignored by society, specifically because they are not mothers. They feel that others undervalue them because of their choice to not have children. Maybe the silencing has to do with ageism? Or body type? Or …….? – maybe women only are SEEN or valued when they are deemed appeasing for the male gaze? When I began looking at this issue further – the un-seeing and dismissing of women specifically, I realized how pervasive and subtle it is; that it happens to many different types of women throughout their lives. The silencing of women in history, stories (sexism exists in publishing https://www.theguardian.com/books/2015/aug/06/catherine-nichols-female-author-male-pseudonym), art (women artists are under-represented in museums https://nmwa.org/advocate/get-facts), and work spheres (ex. Fewer women CEOs; fewer publications in journals by women https://theconversation.com/perish-not-publish-new-study-quantifies-the-lack-of-female-authors-in-scientific-journals-92999 ) has been called ‘The Great Silence’, and the incorporation of the female account has been termed ‘her-story’ (vs history, which I am aware is not a related to the gendered her and his; ex https://herstoryuk.org/ ). Dr. Clarissa Pinkola Estés, a favorite of mine, wrote a fabulous poem, entitled How to Silence a Woman (see here: https://maryannburrows.com/dr-clarissa-pinkola-estes/) The ways are numerous, varied, and exhausting. What is this silence? Why is it so easy to dismiss women? What the hell is going on? In searching for answers, I realized much of the investigations and scope of discussion were limited and focused on problems rather than solutions. I wanted solutions, not blame. I recognized that the silencing was not limited to women, but includes all marginalized groups, such as people of color. Even the privileged such as white men are silenced. I wanted the big picture, the long view. So this post is my attempt at that – finding a way to SEE one another. What is it about being SEEN, or for that matter having voice and being HEARD? – These are longings to be recognized, to be part of-, to be valued, to BELONG. My attempt to find these solutions brings to mind a piece of poetry that I’ve seen circulating: “These mountains you were carrying, you were only supposed to climb” (-Najwa Zebian). Through writing, I am putting down this personal burden, the hurt at not being seen personally and collectively, these mountains……..
Before we go further, I also want to discuss how the writing process works for me, which I have only shared with a small number of people. But, for this piece, the process is particularly relevant. When an idea starts assimilating, I often experience it in a visual representation. This tends to happen during my meditative practices or during exercise, particularly runs on the treadmill that free my mind to wander as my body is occupied in a monotonous, repetitive task. This idea of not seeing women came to me as a battlefield of wounded bodies and dismembered limbs. Grotesque, brutal, and horrifying. An electric feeling in the air that danger was still present. I did not do the wounding, but I was witness to the tragic aftermath and the need for triage and a cremation pyre. I have revisited this image several times as this piece of writing developed, uncertain of what it was trying to tell me, and even requested the counsel of a trusted friend. She thought maybe it was previous generations of women that I was seeing – the damage earlier generations of women had experienced and handed down; that, the intergenerational trauma, is something that needs discussed, but wasn’t what this piece of writing was calling for, though I do believe it is related. After some time, I determined what the imagery represents – a Re-Membering. The need to piece together, to become whole. My hope for this piece of writing is that it can start to do just that – for myself and others. In my search for the answers to the “great silence” – why it is that women are so under-valued, dismissed, under-represented, or un-seen, I read feminist texts and theory, older pieces written decades ago, as well as newer works. Repeatedly during these pieces, the gender divide is cited– men did this, are doing this, unconsciously or intentionally, as a part of the masculine drive to dominate. Obviously, this is an incredibly generalized assessment; I sensed something(s) under the surface that was missed with these accusations. In particular, how the dichotomous, either/or thinking is not inclusive of true gender dynamics, internally (we all have some combination of masculine and feminine energies) and externally (some women are “masculine” in possessing the desire to dominate, some men may express their masculinity as gentle, kind, artistic; some don’t fit the binary at all). Further, either/or thinking fails to acknowledge the participation of women in the systemic silencing and un-seeing, likely un-knowingly and unintentionally. Do women notice or care about the missing perspectives? Do we value non-masculine individuals (women and nonbinary) differently than we value men? And do we not silence men in some profound ways? – ignoring their sensitivities and shutting down their “feminine” qualities ( through patriarchal values, through the boy code; I’ve written about this here: http://getwokecoven.com/a-call-to-arms-on-healing-our-men/). Simple, binary, either/or thinking and finger pointing do not produce sustainable, hefty solutions, which might be why we are still experiencing such gender divisiveness. Further, othering doesn’t stop at gender. In addition to gender (above), dichotomous thinking impacts social categories such as race and class through “othering” – black vs. white, gay vs. straight, rich vs. poor, fat vs. thin (see my blog on radical self love, which discusses body politics). Marginalized groups are also under-represented in professional spheres; their stories, history, art, perspectives are commonly missing from the mainstream (ex. Learn more about the missing black men and the school to prison pipeline: https://www.aclu.org/issues/juvenile-justice/school-prison-pipeline/school-prison-pipeline-infographic and https://newsone.com/3109431/1-and-half-million-black-men-missing/ ). They feel unseen, undervalued, and silenced. (ex. https://theblackwallsttimes.com/2018/02/08/the-purposeful-silencing-of-black-women-in-educational-leadership/ ). Gender, then, is only part of the problem of exclusion and othering that we participate in, and this exclusion can cause extreme problems such as persistent poverty and health disparaties (ex. https://www.theguardian.com/global-development/poverty-matters/2012/mar/09/gender-inequality-poverty-exclusion and https://www.npr.org/2017/12/07/568948782/black-mothers-keep-dying-after-giving-birth-shalon-irvings-story-explains-why ). What are we doing to each other? Brené Brown explores belonging and “othering” in Braving the Wilderness when she discusses dehumanization – the exaggeration of “other” for the creation of an “enemy” or “people on the other side”, people seen as less than human so that acts of violence become permissible. Brown applies her concept of dehumanization to several current political topics, one being the Black Lives Matter movement as opposed to All Lives Matter. “Shouldn’t the rallying cry just be All Lives Matter? No. Because the humanity wasn’t stripped from all lives the way it was stripped from the lives of black citizens. In order for slavery to work, in order for us to buy, sell, beat and trade people like animals, Americans had to completely dehumanize slaves. I believe Black Lives Matter is a movement to rehumanize black citizens. All lives matter, but not all lives need to be pulled back into moral inclusion.……Is there tension and vulnerability in supporting both the police and the activists? Hell, yes. It’s the wilderness. But most of the criticisms comes from people who are intent on forcing these false either/or dichotomies and shaming us for not hating the right people. It’s definitely messier taking a nuanced stance, but it is also critically important to true belonging” (pg 77). However, establishing or hinging identity to specific aspects of self, whether that is race, gender, sexuality etc, we create barriers, and the more strongly these categories are identified with, the harder it is to overcome or dismantle these barriers. While categories provide cultural or social context and group cohesion, they are also cheap, easy, miss the big picture and specifics of that individual and harmful when over-identified. Categories silo or cage people, trapping a person on one side or the other. Further, these categories aren’t clean – where do you draw the line? Take gender for instance; it exists on a spectrum, biologically (intersex) and with gender presentation and even sexuality. Skin color is also a continuous trait, not easily divided, and identity based on color alone is flawed and inaccurate. For example, race is a social construct; genetically, race doesn’t exist, as there is greater genetic variation within racial groups of people than between groups of people. Further, as bell hooks points out, group identity is important, but when it is THE MOST important aspect of an individual, that identity can be problematic and used to justify “otherness”. A briefly critical eye will show the fallacy of these fortifications and concepts of separateness. Emphasis of categorizing individuals risks othering, conflict, and dehumanizing. We” other” people, un-see people, in all kinds of ways with painful outcomes of under-representation, bias, and disparities. The problems aren’t new; perhaps we need a shift in the narrative, how we are framing the problem to acquire new perspectives, understanding, and solutions. Instead of race, gender, sexuality, etc being either/or, it is actually an issue of holding space and complexity for both/and. These topics are related to identity politics – how we identify and how strongly that identity holds us can be problematic and leading to dichotomy, either/or, othering. We are not post-identity and shouldn’t shun or shake off identity because it is messy and we can’t navigate it well. Instead, we need to embrace the multi-faceted beings of each other. It is not easy, it is not cheap, but it is rewarding, it is SEEing, it is Belonging. Luckily, I happened to find a book by Carol Lee Flinders called Rebalancing the World: Why Women Belong and Men Compete and How to Restore the Ancient Equilibrium. Rather than looking at the history through a gendered lens (despite the title), Flinders notes that humanity has possessed two different systems of cultural values throughout history: the culture of Belonging and the culture of Enterprise. In Rebalancing the World, Flinders argues how the severance of women from men, the splintering off of groups, the othering that comes with priviledge of a few, occurred with changes associated with the Agricultural Revolution approx. 10,000 BCE. Prior to agriculture, Flinders suggests that humans had a value system that emphasized belonging, with coherent elements including spirituality, inclusiveness, generosity, mutuality, connection with the land. This Culture of Belonging is what encased humanity for hundreds of thousands of years, it is our evolutionary history, and as such, are “habits of the heart” and are “deeply engrained in human behavior” and unconscious (pg 42). Agriculture allowed for an accumulation of wealth, changes and stratification in economics, job specialization, stationary livelihoods, and larger populations, and with these changes came new values and cultural dynamics. With agriculture, innovation took precedence, but so too did accumulation, individuality, exclusivity, binary visioning, hierarchy, materialism, competition; prior, these tendencies were kept in check, subdued by social cohesion. This is the Culture of Enterprise, of which we now occupy, and with enterprise, women were commodified, seen for their reproductive value, as they specialized in child rearing. With the shift in values, the old ways of being and belonging were associated with the feminine (the new ways, masculine) and, along with women, limited, silenced, exiled. In other words, Flinders not only explains when and why women became seen as less than men, but how certain values were associated with masculine or feminine. Flinders repeatedly mentions throughout her thesis that the separation of the genders is false – men show traits that are feminine and vice versa and that this separation is only part of the problem. We need to restore or integrate some of our “heart habits” back into practice for our mental, physical, environmental wellbeing, as well as a way to stay or limit privilege (class, gender, race, sexuality). Again, What are we doing to each other? This sectioning off, this exclusion, this othering? It makes me heart sick, and I am f*%$ing done with it. We inherited these scripts of Enterprise (which includes those of patriarchy) that reinforce the status quo of exclusivity. This is not how we evolved, and this othering is a form of collective trauma against our “heart habits”. Belonging, then, is our shared, collective history, it is the way of our hearts, and rather than being an issue that is limited to gender, it is an issue of our culture and values. In The Fruitful Darkness, Joan Halifax explores what she calls the World Wound, which in shamanic and Buddhist traditions, is something we all bear just by being born. It is our collective suffering, beyond just the physical to include the psychological, the cultural, the animate, and the ecological worlds. The idea of a World Wound is reminiscent of the collective wounding, or psychic trauma in our collective unconsciousness, from all individuals through time. Can you sense into how your personal wounding contributes to that of others, across time – past, present, future, to the wounding of the collective? Through your present interactions with others? Through your sense of place and how you view the earth (to dominate or to co-exist)? The wounding can be from your past, only to fester into complications in the present (such as Adverse Childhood Experiences https://www.ted.com/talks/nadine_burke_harris_how_childhood_trauma_affects_health_across_a_lifetime ). Trauma can be transgenerational, from our ancestors – accumulated detritus from abuse, neglect, poor parenting, financial struggle, etc and even exist in our DNA (ex the trauma of the holocaust changed peoples’ gene expression https://www.theguardian.com/science/2015/aug/21/study-of-holocaust-survivors-finds-trauma-passed-on-to-childrens-genes Trauma from slavery https://www.teenvogue.com/story/slavery-trauma-inherited-genetics and https://www.sciencedaily.com/releases/2014/04/140413135953.htm ). The World Wound or collective wounding augments the idea of non-duality – that is, we are not separate from one another, from the earth and its inhabitants, from linear time (past, present, future), or even from pieces of ourselves (such as shadow). Duality lends itself to separateness and isolation, which is at the core of our longing, our need to Belong, to be nondual from ourselves, others, and source (God, the great mystery, spirit, inner knowing, etc). John O’Donohue explores our collective wound in Anam Ċara – how our sense of separateness from our own inner world, cutting ourselves out of the sacred with our dualistic view of the holy (or source, inner world, the invisible, the Truth) is the ultimate spiritual wound. We see God/source/sacred/etc as without rather than within. We can sense the sacred within solitude and with other practices of inner being, such as breathwork, meditation, or prayer. Topo-ka Turner in Belonging: Remembering Ourselves Home explores the issues of othering, un-belonging, separation from yourself, each other, the world and a greater purpose. We are “made orphans by a culture that, in its epitomizing of certain values, rejects others, forcing us to split off from those unwanted parts of ourselves. And this is perhaps the worst orphaning act of all, because it is abandonment in which we are complicit” (14). The splintering of the self is cogent to shadow work (see my blog post: What is Shadow Work?). Turner calls this wounding, this separation from our own selves, from our communities, from others as the Great Forgetting (64), a form of self-betrayal, a “devaluation of our heart’s longing” (64), our longing for reciprocity, for meaning and creativity. This desire to be seen and belong is not so much narcissistic, as it is a need for each of our stories to come forward, to allow healing and connection on a personal and community level (64). To belong, re-member, is to awaken ourselves and each other, which can be vulnerable and terrifying, as it means “the complete obliteration of life as you knew it……Like circling vultures, some of our most frightening adversaries have been waiting for this moment. We are at our most vulnerable when we’re in defiance of the status quo, and they can smell it. All that has been controlling us from the shadows now comes into the open, rearing up twice as fiercely at the threat of dethronement” (73; see also 105-138). Further, belonging to ourselves and each other on an individual level, according to Turner, requires creativity and a decolonization of that term so that we can recognize each other (102). Everyone is an artist – this might be the “typical” painting, writing, music-making or can be the subtle how you move your body in dance or workouts, how you raise your kids, your contemplative practice. The artist’s path is the spiritual path, as the soul seeks expression (for more, see Dr. Clarissa Pinkola Estés’ The Creative Fire and John O’Donohue’s Anam Ċara). In addition, belonging requires a letting go of the need for perfection (97-101), which as I cited above, is the enemy of “done”. Belonging necessitates coming home to the soul and ancestors (“holy longing”) as well as "individuation” (155) which is the practice of becoming a full human being, of helping others on a soul and heart level ( Dr. Clarissa Pinkola Estés Seeing in the Dark). Related to creativity, belonging needs the giving of your gifts and having your gifts received. Turner refers to this as “beauty medicine” and “life as offering” to the debt of your life that can never be repaid; “So long as we are only offering ourselves partially, from behind the protections of our persona, our true kin will never recognize us” (168). Lastly, belonging is the ability to express gratitude, worthiness, and pleasure, to be comfortable with ambiguity, paradox and move away from binary thinking, categorization and othering. “The work of undermining the barriers between things moves us from alienation to intimacy. We begin to see the partisanship in our own ideologies, the mechanisms we employ to keep others at any distance from our lives…..Naturally, this inner diversity translates to outer inclusivity” (194). Turner suggests that the creation and support of community is a practice of belonging that requires reciprocity; engaged conversation and action around shared values; circles and ritual; respect of eldership (which is not distinguished by age but by wisdom); seeing and being seen (surrendering, being vulnerable, practicing inquiry, truth, and an open heart); “becoming a lowland” (be the medicine for someone else’s pain; Turner quotes Rumi here “Where lowland is, that’s where water goes. All medicine wants is pain to cure”); “leaving well” (recognition of the need of separateness); “be the longing”, that is if you can’t find a place or people to belong to, be that person and place for others; and reciprocity with nature and a recognition of interrelatedness with all and belonging within an ecosystem, a place. Belonging, SEEing one another requires individual and collective Work and commitment. How do you currently incorporate or oppose the practices of belonging? What is your beauty medicine? How are you vulnerable? Do you feel your ancient connection to the Earth and other humans and sentient beings? The discussion of belonging brings me to the ultimate consideration of the human experience: What is the purpose of life? This is the hallowed ground of mystics, artists, contemplatives, scholars, and in recognizing that, I don’t want my answer to sound flippant or irreverant. The answer to this existential question has been implied above: Belonging. But what is that really? - to love well and to adventure. Love of an“other”, the deep love that comes with SEEING, opens us to “other” – here we are moving beyond difference into consensual intimacy, into longing for kin, for partnership. With love, barriers crumble; you see the true occupancy of an-“other” ’s humanity, of their life. “it is love that will save our world and our civilization, love even for enemies…. love is not this sentimental something that we talk about. It’s not merely an emotional something. Love is creative, understanding goodwill for all men. It is the refusal to defeat any individual.” (Dr. Martin Luther King, “Loving your enemies” sermon found https://kinginstitute.stanford.edu/king-papers/documents/loving-your-enemies-sermon-delivered-dexter-avenue-baptist-church). Adventure is also required for Belonging and fullness of life. Serge Kahili King wrote about the path of the adventurer in Urban Shaman: A Handbook for Personal and Planetary Transformation Based on the Hawaiian Way of the Adventurer. The path of adventure doesn’t focus on power or conquering of the self, but on love of travel, acquiring and sharing experience and knowledge, being comfortable with change and new ways being and doing (29). Adventure exposes you to Other – other people, situations, ways of thinking, than you likely participate in on a daily basis. In acquiring and integrating this knowledge, you expand belonging and sense into shared states of being and our interconnectedness, with all of life. Adventure for the purposes of living life and belonging needn’t be expensive, expansive trans-continental trips, but the vulnerability of opening up to a neighbor (“hey, tell me about that thing…..”) for example, exploring the landscape of your inner being, and unfolding to new ways of thinking and being. The path of the adventurer is the creative path, it is the spiritual path. Artists, mystics, adventurers yearn to find that “missing one” (longing, belonging). Dr. Clarissa Pinkola Estés calls this the tribe of the Sacred Hearts (Seeing in the Dark). These creative adventurers recognize the resonance of art, of creativity, of spiritual endeavors; they recognize that they are whole and want to know their parts (i.e. inner world, inner belonging). These are individuals with a “fire of excitement”, and Estés says you can spot them because they are fired up, with hair flying off their head, clothes on sideways. Adventurers, artists, mystics are the same – they seek fullness in their lives, to know themselves, to know others and find their tribe (i.e. belonging), to see in different/unusual ways (“see in the dark”), and have highly developed instinctual selves from their inner knowing. They are typically relegated to the fringe of society, but Estés suggests, they are actually on the frontier. I can Other with the best of them. Indeed, my website’s name is a form of othering: Wild woman in the suburbs. As if I am or “they” are other. The irony is not lost on me. My ancestors were tribal, painted their bodies blue, and whose crest, depicts in part, a raised fist. This tribal inclination, the protection of those closest to you while excluding “others”, and fierceness I feel deep within. My Myers-Briggs personality is called the Protector (also advocate, activist; INFJ). I identify with the path of the bodhisattva, although I have not taken formal vows (I shy away from institutionalized spiritual practices). “As long as space endures, as long as sentient beings remain, until then may I too remain and dispel the miseries of the world”. Mix together this ancestral Celtic heart, INFJ, and a pinch of bodhisattva and watch me spin. In a relational context, I “other” when someone in my immediate group has been hurt – I summon my inner gladiatrix weaponized with muscle, metal, fire, and teeth. I draw hard lines to separate, keep “others” out. But upon closer inspection, these lines are actually circles, containers of protection. My practice here is to see the humanity, to keep compassion and empathy for the other, to not allow my desire to protect and defend actually create more harm, more hurt. Further, I sense my belonging in groups that are traditionally marginalized, the fringed, to help, to give voice, to witness. Those that harm these groups tend to be my “other”, and part of my practice is to maintain understanding, to not dehumanize these “others” (see Brené Brown’s Braving the Wilderness). Without getting specific, I have spent a better part of my life impassioned, which often manifests as anger. For many years, I could not isolate the source of these big feelings. But now, I have clues. I suspect it is the cultural wound. The always looking outside one-self , seeking for belonging, and getting frustrated, disappointed, angry that I couldn’t find my people. Feeling like a black sheep in my family of origin and family of marriage. Feeling “other”. Feeling fringe. I recognize now that it is my job to belong to myself. To stop seeking and be that refuge of being for others. To be reckless with my love, my heart, and give it away, as much as possible, because hoarding my love, my voice, my refuge, doesn’t serve others, or myself. “There are moments that cry out to be fulfilled. Being impassioned, I am also empowered to FEEL, to doff the camouflage of a hardened heart and busy life and be in empathy. In fact, you can find me in this space of fullness – wild hair, crooked clothes (see Dr. Clarissa Pinkola Estés’ Seeing in the Dark), goosebumps and tear-stained eyelashes. My big feelings are a gift, and, as was told to me by a mentor, by expressing them, I give space and permission and resonance for others to feel and to heal (i.e. belonging). My big feelings allow me to sense and notice things differently, to “See in the Dark”, to be a medial woman (or better yet, “person”; for more on the Medial Woman, see Seeing in the Dark). Indeed, my deepest friendships are with those that have big feelings and can also see in the dark, into that liminal space of substance. We know how permeable binary categorization is. We see life instead as spectrum, and these friends, like me, refuse to engage in “othering”; we are not having it. Part of my yoga training was in regards to protecting or closing down part of myself, as “pain sticks to pain” we were told. Don’t feel all of the feelings, limit access to that which is precious and hurting. This is reminiscent of the warrior path – the hardened way of being that encapsulates parts of yourself to protect, and it feels very dualistic to me, the separation of self from feeling, self from other. And although I very much relate to the warrior (fire and protection, see my other blogs), this emotional stifling was not, is not, intuitive to me. Indeed, I have cried as well as occupied intense joy when teaching a yoga class, I have shook and cried and felt blissed out when leading a woman's circle, I have startled neighbors with my tears. My feelings are BIG and ALIVE and, as an empath, not entirely my own. I align more easily with the path of the adventurer. To meet new people, be in new places, to learn, to create, and above all, to love, to relate, to experience what others are living and feeling, to have empathy, to belong and "be the longing" for "others". This is fierce, giving love. It is reckless and disobedient, obstinate in its refusal to stop flowing. It is not a path easily undertaken as it is painful. You will get walked on, you will get wrecked, you will give heart away too much, too soon, too often. But in doing so, you can build a bigger container or capacity to feel and to heal and to hold space for others. How do you keep your heart open? Despite it all? Despite people taking much more than they need or not really seeing you (ie reciprocity, a requirement of Belonging)? This question challenges me. To shut down and close the heart to those who are greedy, needy, or just don’t value you can be a form of self-preservation, while sharing your gifts and love only with those who can truly utilize and appreciate them. But this leaves the world in a deficit and is a form of “othering”. 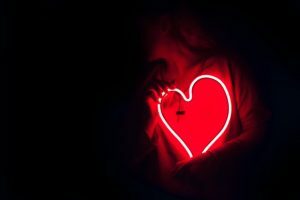 To survive and keep your heart open in fierce love and deny “othering”, you will need discernment – to recognize when the path to another is not ready to be tended, that you aren’t needed or wanted, that you actually have gone too far astray. The practice of radical, soul-level, creative self-care is a necessity to practice fierce love and avoid pouring from an empty cup (ex. Meditation, energy work, self-inquiry, anything that makes your heart sing). My fierce little heart lives on my sleeve, at the ready; you can find me by the trail of the wreckage of my being after I have allowed the feelings in. It is a beacon that instead of seeking, brings others to me, who have an open heart or are unfolding, doffing their chain-link protection. Heart light as a light tower, watchtower in the dark, as resonance along your path, as internal bonfire to share heat, passion, and spark. As a child of the 80s, this furious little red light in my chest reminds me of the movie ET – his internal, red flicker of light calling his family to him, calling him home. The thing is – we are already home, hOMe. We already belong. To ourselves, to source, to each other. We have only forgotten each other, we have only forgotten the habits of heart. Agreeing to tend the path of fierce love, to slash and burn or cultivate with care, we are awakening ourselves and others to love and belonging. We are learning to SEE and be SEEN. We are looking beyond binary thinking to hold space for both/and. We are all bodhisattvas. We are re-homing, re-membering, re-hearting each other. And that’s the whole point. Welcome home, loves. I see you. We see you. In deep, fierce love. **Addendum** After completing this piece of writing, I have come across additional, related resources that might be of interest to the reader.